Editors’ Note (Philip Shapiro): Dr.Sorrel Kerbel’s great-grandfather, Rabbi Bezalel Shlomo Ha-Cohen Katz (1843-1939), was a prominent Hasidic rabbi in Rokiskis and the story of his family provides a glimpse of Jewish life in that shtetl from the 19th Century until its destruction in 1941. This article first appeared in two instalments in Shemot, the journal of the JGS of Great Britain, March 2003, vol. 1.1, and June 2003, vol.II.2. Dr.Kerbel is the editor of the Routledge Encyclopedia of Jewish Writers of the Twentieth Century, 2003 and 2010, a reference work providing essays on the “Jewishness” or not of some 350 Jewish novelists, poets and dramatists all around the world. She received a D.Phil. in English literature from the University of Cape Town. She taught English literature at the University of Port Elizabeth, where she and husband Jack lived for 24 years before emigrating to London. They, their three children, and eight grandchildren live in the UK, where she is an independent researcher and reviewer. She has also worked for some years in London with Holocaust survivors through Jewish Care. The original version of Dr.Kerbel’s article, “Tracing My Roots in Rakishok” was published on the Rokiskis Kehilalinks website at http://kehilalinks.jewishgen.org/rokiskis/sorrel.htm. For this publication, she has updated her article. Dr.Kerbel holds the copyright to this story, which may not be used without her permission. Author’s Introduction to the Updated Article. As a result of the publicity generated by the publication of my article in 2003, I discovered a very special relation in Cape Town, Attie Katz. This updated version is dedicated to him and to the honoured memory of all of my family who perished at the hands of a few Nazis and their willing Lithuanian collaborators in the Lithuanian Shoah. A new exhibition currently on show (2017) in Berlin about Litvak Jews for the first time acknowledges German responsibility for the “deaths by bullet” in Lithuania. I would like to use here a quotation from Roger Cohen’s essay, The Girl From Human Street, which was dedicated to his mother (New York Times, April 1, 2016). “Every Jew of the second half of the 20th century was a child of the Holocaust. So was all humanity. Survival could only be a source of guilt, whether spoken or unspoken. We bore the imprint of departed souls … I wanted to understand where I came from.” This article, “Tracing My Roots in Rakishok,” reflects my personal quest to understand where I came from and to remember so many names from the silenced past. I am grateful to many for helping me update this article, including, but by no means limited to, my husband Jack, my children and grandchildren, Shemot, JewishGen’s Yizkor Book Project, Philip and Aldona Shapiro in the USA, Giedrius Kujelis of the Rokiskis Regional Museum, and my many friends and family who helped me organize genealogical details, namely (in alphabetical order), Cookie Epstein, Ada Gamsu, Dorothy Gelcer, Julia Segal-Holzer, Gerry Hornreich, Anne Martin, Ros Romem, Paul Teicher, the Todres brothers and my Windisch family. One of our most amazing new links is to my favourite Yiddish playwright and novelist, Sholem Aleichem, and his daughter Bella. Reb Bezalel Shlomo Ha-Cohen Katz (centre) with his son-in-law, Reb Avrom Meirowitz (left), and Reb Bezalel’s nephew, Rabbi Shmuel Yalowetsky. The photograph was taken in Rakishok on the eve of Rabbi Yalowetsky’s departure for the USA, where he would be known as Rabbi Samuel Yalow of Syracuse, New York. The two younger rabbis received smicha from Reb Bezalel. Rabbi Yalow is wearing a new straw hat to show off his role as a soon-to-be American. This is the only known surviving image of Rebbetzin Sorke, the wife of Reb Bezalel Katz, for whom I am named. She is shown here with her grandson, Israel Meirowitz, on the enclosed porch of their house, which stood facing the market square of Rakishok. Rakishok developed from an estate owned by the Polish house of Kroshinsky. The widowed Princess Helena, the last of that family, married Count Tizenhoff, and Rakishok passed to the family of the Counts Pshezdetsky. The impressive St. Matthew’s Catholic Church, which overlooks the market square, was built between 1866 and 1885 upon the initiative of Count Reynold Tizenhoff. It is positioned to have a clear view beyond the market square to the front of the Tizenhoff manor house, one kilometer to the east. Then, as now, its towering spire dominates the landscape. Reb Bezalel (1843-1939)4 was born in Rakishok and lived “for as long as anyone could remember” on the Kamayer Gasse (now, Respublikos gatvė). This street originally led directly south from the market square to Kamai, which is 11 miles away. Across from Kamayer Gasse the market place would particularly bustle on Mondays, which were market days, on Sundays, when churchgoers would patronage Jewish shops, and especially on fair days, when thousands of peasants would come to town. Near his Kamayer Gasse house were the Batei Midrashim (houses of study) on Synagogue Street (now, Sinagogų gatvė). From the time that Lithuania became an independent country, the synagogues were painted, respectively, the colours of the Independent Lithuanian flag – the yellow one was for scholars, the green one was for community leaders, and the red one, which was the largest, was for the general community. Prior to the First World War, there was a fourth synagogue nearby on Pirties gatvė (Bath Street) that had been built for use by mitnagdim. That synagogue had its own mikveh (ritual bath). During the First World War, the mitnagid synagogue was destroyed by a fire. Of the many Jews who fled either to Russia or Germany during the war, the relatively few mitnagdim who returned to Rakishok could not afford to rebuild their synagogue. As a result, it was agreed that the great (“red”) synagogue would be used by everyone in the community. Near this area were other buildings that were important for business, such as most of the larger shops for textiles and leather goods, flour storehouses, warehouses, a bank, and even a showroom of Singer’s Sewing Machine Company.5 The bank, which was known as the Rakishker Yudishe Folkbank (in Lithuanian, “Rokiškio Žydų Liaudies Bankas”) was the Rakishok branch of the Folkbank. The Folkbank was established after the First World War with assistance from the Joint Distribution Committee (“Joint”), an American aid organization, and had several branches in Lithuania. (There were also branches in six Balkan countries). 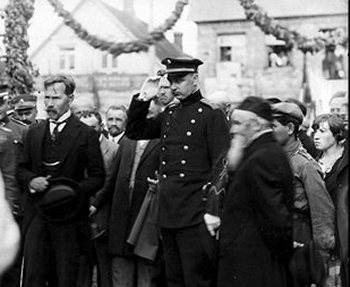 Reb Bezalel was the “official” rabbi of Rakishok, and met the first President of Independent Lithuania, Antanas Smetona6, on his visit to Rakishok on the occasion of the opening of the new railway station, circa 1920. He stood, a frail figure, on the festooned podium with the president and Graf Tizenhoff. Later that day; the President visited the synagogue complex. In the photo on left: My mother Nechama (centre), with her sister Liebe-Leike (Leah) far left (with fringe). Photo on right: Joseph Caspi (centre) with a pro-gymnasium class. To the right of Caspi is my mother Nechama and to the right of her is her sister Liebe-Leike. In the second row on the left, wearing a white collar, is Julia Segal Holzer. After working for the Baron, Reb Bezalel received smicha (becoming ordained as a rabbi) from his father, Reb Yosef Ha-Kohen Katz, who was then the rabbi of Rakishok. Reb Bezalel served as a rabbi in Karsevke, (now, Kārsava, Latvia, which is about 82 miles northeast of Dvinsk (now, Daugavpils), Latvia), where he had a “guten nomen” (good name/standing). (This is a reference to Pirkei Avot (Ethics of Our Fathers) 4:13, in which it is said that “there are three crowns: the crown of Torah, the crown of priesthood, and the crown of kingship. However, superior to all of these is the crown of a good name.”) For his second rabbinic post he returned to Rakishok, inheriting the rabbinic “kisei” (seat) of his father, Rabbi Yosef HaKohen Katz. My great-grandfather, Rabbi Bezalel, and his wife Sara had a daughter and three sons. Their daughter, Asne Rifke (1876-1941), married my grandfather, Rabbi Avrom (Abraham) Meirowitz (1875-1941), who is discussed below. Reb Bezalel himself came from an important family. His father, Reb Yosef Ha-Kohen Katz, was born around 1828 in Rakishok and had six sons, some of whose descendants managed to escape to South Africa, Israel, Australia, and the USA. Avrom Leib, the eldest, was the great-grandfather of Dov Katz of Pardes Hanna (Karkur), Israel, Attie and Sheilah Katz of Cape Town, and Ann Martin of Johannesburg. Bezalel, the second son and my great-grandfather, was also the great-grandfather of Thelma Windisch of London, Aharon Barak and Avi Kalir of Tel Aviv, and Riki Hirsowitz of Sydney, Australia. The descendants of Berzik, the third son, established the jewellery store Katz & Lurie in Johannesburg. The descendants of Shmuel, the fourth son, perished in Lithuania. The fifth son, Yaakov Katz (b. 1879 in Rakishok), married Reisa Galbershtat of Rakishok (1879-1939). Their son, Chaim Tuvia Katz (1909-1990), was a founding member of Dafna (3 May 1949), a kibbutz in the Upper Galilee of Israel. He and his wife Chaya Shein Czarka had two children, Tsofar Katz and Avigail, who live in Haifa. The sixth son, Shnuer Zalman (Shneyer Zalman) (b. 1881), died in Abel in 1941. Reb Yosef also had two daughters, one of whom, Raisa Devorah, married Reb Zecharya Alter Abrahams (whom my mother called called “Avromtzik Jossel”). Their son was Chief Rabbi Prof. Israel Abrahams of Cape Town, who was the father of Ros Romem of Jerusalem. The fourth son of Reb Meir Ha-Kohen Katz, Tzvi Hirsch Rabinowitz, showed an early inclination for mathematics and physics. From 1852, while studying in St. Petersburg, he began work on a comprehensive Hebrew-language project that was intended to encompass all the fields of physics. At length, one volume was published, in 1867, which was entitled, Sefer ha-Menuchah ve-ha-Tnuah (“The Book of Rest and Movement”). 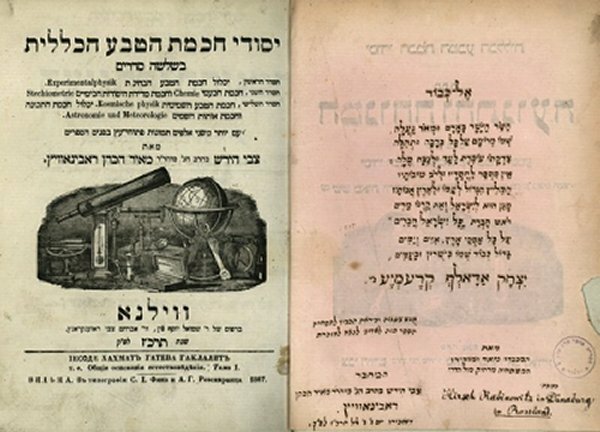 Tzvi Hirsch also wrote Hebrew-language books on mathematics, magnetism, chemistry, and steam-engines, thus enriching Hebrew terminology in these fields and bringing them to the attention of Hebrew readers. He also published many articles in Ha-Meliz (“The Ornamentation”) and in several Russian periodicals which he edited and published, including Russki Yevrei (Russian Jews) from the late 1870s until 1885. All of his books were published in Vilna/Vilnius. Title Page of Tzvi Hirsch Meir HaCohen Rabinowitz’s “Yisodei HaChachmat HaTeva HaKlalit,” Vilna (1867). As noted above, my great-grandparents, Rabbi Bezalel and Rebbitzin Sorke Katz, had a daughter Asne Rifke (1876-1941), who married my grandfather, Rabbi Avrom (Abraham) Meirowitz (1875-1941). Avrom Meirowitz was the fourth child of Moshe and Rifke Meirowitz of Karelitz (Karelichi), a town 15 miles east of Novogrudek that was in the province of Minsk. Moshe and Rifke had 6 children, namely, Berl David, the eldest, whose family settled in Rhodesia and Israel; the second son Yaakov, who emigrated to the U.S., where there are many cousins; Ethel Cohen, who died in 1941; my grandfather Avrom; Yudel, who died in 1941; and the youngest, Meir, whom, they said, was killed by the Cossacks. Meir’s wife Machle (nee Sachar) was from Kupishok and her brother, A. L. Sachar, was the founding president of Brandeis University. Her children settled in Israel. Avrom Meirowitz studied at the yeshivas of Mir, Slobodka, and Volozhin (where his study-partner at one time was the renowned Hebrew poet, Chaim Nachman Bialik). When my mother, Nechama Meirowitz-Stein, was born in Rakishok, the couple lived in her grandfather’s home because her father served in the nearby shtetl Skimiahn (Skemai, which is about 6 miles northeast of Rakishok). My mother Nechama wrote in the Yizkor book that her father, Rabbi Avrom Meirowitz, was a wise man who was no stranger to world affairs despite having lived in a relative backwater. He was a mitnagid who read many secular books. His command of Russian and German, acquired on his own, led him to read the great literature of those languages, including the works of Dostoevsky and Tolstoy. My grandfather’s horizons went well beyond the confines of the narrow world of the shtetl. He was a founding member of the Rakishok branch of the Folkbank and served as the bank’s director in Rakishok. In addition, he went often to Ponovezh (Panevėžys), where he sat on a rabbinical arbitration board to resolve disputes among litigants. Rabbi Avrom Meirowitz was the chairman of the Folkbank. He is shown here, in the centre of the front row, with other members of the management board. First row, sitting right to left: Shloime Arelovits, Hillel Eidelson, Abba Leib Dovidovits, Avrom Meyerowitz, Leib Segal, Zalman Milner, Israel-Leib Snieg; Second row, right to left: Isaac Panets, Chaim-Moteh Lekach, Avrom Harmets, Yudel Gafanovits, Hertze Lang, Yosef Caspi; Third row, right to left: Velvel Lipovits, Mr. Bar, Nahum Katz, Solomon German. The marriage of my grandfather, the mitnagid Rabbi Avrom, to my grandmother Asne, the daughter of the hasidic Rabbi Bezalel, reflects a good deal of tolerance on the part of the latter, who even permitted the young married couple to live in his household. By the middle of the 1920s, with anti-Semitism growing in Lithuania, many Jews began to consider emigrating, especially to Palestine. The Balfour Declaration had promised the establishment there of a Jewish homeland. My grandfather, Rabbi Avrom Meirowitz, had a strong Zionist orientation (perhaps acquired at Volozhin Yeshiva, which was known for its espousal of Zionism). This inclination led him to join the Mizrachi - the National Religious Party - within the Zionist movement, and he appeared as a speaker at their meetings and rallies. As a result, understandably, he was less popular among the ultra-orthodox Agudas Yisroel circles. Left photo: My grandfather, Reb Avrom Meirowitz, the last rabbi of Abel. Right photo: My grandmother, Asne Rifke Meirowitz, with her two grandchildren, Josef and Ester Michelson, the children of her eldest daughter Taube Mirkes. All were murdered in Abel in 1941. In 1928 my grandfather became the rabbi in Abel (Obeliai), nine miles to the east. At a rabbinical conference in Ponevezh in the late 1930s, he warned his audience of the imminent dangers of Nazism, saying they were mistaken in thinking Hitler’s objectives were confined to the destruction of only German Jews. This raised much criticism among the Agudah delegates, and his admonition fell on deaf ears. 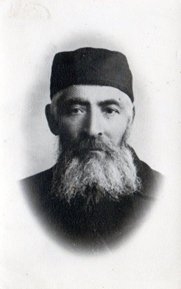 Although Reb Avrom possessed immigration papers for America, his wife, Asne Rifke, refused to leave Lithuania without her grandchildren. Sadly, he met his death from an axe wielded by a Lithuanian collaborator while standing on the bima of the shul in Abel, where all of the Jews of the village were held in August 1941. He was thus the last rabbi in Abel. Because of my mother’s delicate health, the truth of his death was kept from her, and the sanitized version she gives in her essay is not correct, according to my mother’s last surviving sister, Rochel (Rachel) Kalwaria of Kiryat Ono, Israel (July 1995). In this photograph of the 1932 graduates from Vytautas Magnus University, my mother, Nechama Meirowitz, is shown on the next-to-bottom row, on the far left. Immediately to the right is her sister, Liebe-Leike Meirowitz. Photo of my mother’s brother, Dr. Israel Meirowitz (front row, second from the right), with colleagues at a hospital in Kaunas. In 1944, while out on a medical call, he was shot dead. In Lithuania, my mother’s family and friends gave her the nickname “die shvartze varona” (“the black crow/raven”) because she forewarned of a dismal future for Jews in Lithuania and tried to convince them to emigrate. After her graduation from Vytautas Magnus University she left for Jerusalem, where she married my father, Nathan Stein, and then migrated once more (with my sister Thelma) to Cape Town, South Africa. A boating party in peaceful times on Lake Obeliai. 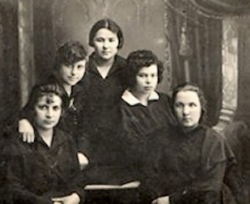 Fourth from the right is Julia Segal Holzer, my mother’s friend who was also saved in the maline in the Kovno ghetto. Third from the right is my mother’s brother, Dr. Israel Meirowitz. Second from the right may have been Israel’s fiancé, Miriam Jaffe, from Kupishok. 1 Nechama Meirowitz-Stein, “A Few Words in Place of a Tombstone” in Yizkor-Book of Rakishok and Environs, edited by M. Bakalczuk-Felin, Johannesburg, Yizkor Book Publishing Council, 1952, pp. 145-149. Most of the family information here was learned at my mother’s knee or contained in her essay. I am indebted also to Alan Todres of Chicago and Raymond Karpelofsky of London who helped me with the Yiddish translation. 2 Nancy Schoenberg and Stuart Schoenberg, Lithuanian Jewish Communities, New York, Garland Publishing, 1991, pp. 240-244. 3 R. Aarons -Arsch, “Notes on the Economic Position of the Jews in Rakishok.” in Yizkor-Book of Rakishok and Environs, pp. 19-29. 4 The All-Russia Census of 1897 gives ages for Reb Bezalel and various members of the family which do not coincide with the ages presented here. For the purposes of this article, I have chosen to use the ages recorded by my mother in the Yizkor-Book of Rakishok and Environs. 5 A. Orelowitz, “Rakishok Before and After World War I” in Yizkor-Book of Rakishok and Environs, pp. 7-18. 6 Antanas Smetona (1874-1944) was the president of Lithuania from April 1919 to June 1920 and then from late 1926 until the end of the first Lithuanian republic. During most of the latter period, he ruled as an autocrat. Ostensibly and officially a “friend of the Jews,” he surprised the British Consul in Kaunas by describing the Jews of Lithuania as “active Communists” and “dishonest traders.” Masha Greenbaum, The Jews of Lithuania: A History of a Remarkable Community 1316-1945, Jerusalem, Gefen Publishing, 1995, p. 279. On June 15, 1940, as the republic succumbed to Soviet annexation, Smetona fled to Germany, and a year later moved to the USA. 7 Feiga, my mother’s cousin and the daughter of Aharon Katz, married Josef Caspi (Serebrovitz), who wrote as a Jewish journalist using the name “Caspi.” He was born in Rakishok, worked first at the Folkbank (employed by Rabbi Avrom Meirowitz), then as principal of the Tarbut School and Pro-gymnasium in Rakishok. Because of his capitalist views, he was imprisoned in 1940 during the initial Soviet rule and released shortly after German occupation in late June 1941. He then threw in his lot with the Germans so that he could fight communism. He was exempted from wearing the yellow Star of David and allowed to live in Kaunas outside the ghetto and even to carry a gun. He was, in his own mind, “a living legend who will go down in Jewish history” (his words to the Council in the Kovno ghetto). He acted as an intermediary between the ghetto council and the Nazi commandant. In October 1941, he was sent to Vilnius. In June 1943, back in Kaunas, he was shot by the Nazis together with his wife and two daughters. Shortly before his death Caspi addressed the Jewish council of the Kovno ghetto, “You entertain illusions of survival. I know that if I survive, it will only be by chance.” (He is shown in the photo above of the pro-gymnasium class with my mother and her sister Leibe. An account of this story appears in Avraham Tory’s Surviving the Holocaust: The Kovno Ghetto Diary, Cambridge, Massachusetts, and London, Harvard University Press, 1990. Click here to continue reading Part 2 of this fascinating story.